The Rotary Club of Auburn, Alabama awarded the Public Safety Officer of the Year to Lt. John Benefield of the Auburn Fire Division at its September 23, 2015 meeting. The award comes with a $500.00 check for the recipient’s division. 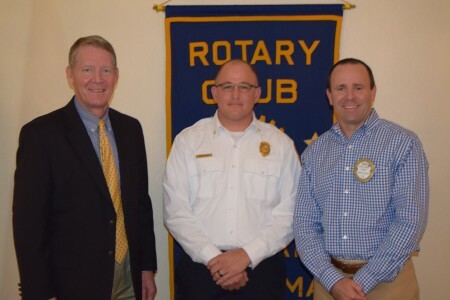 Pictured are: Bill James, Auburn Public Safety Director (left); Lt. John Benefield, Auburn Fire Division (center); and Brad Wilson, Auburn Rotary Club President (right).